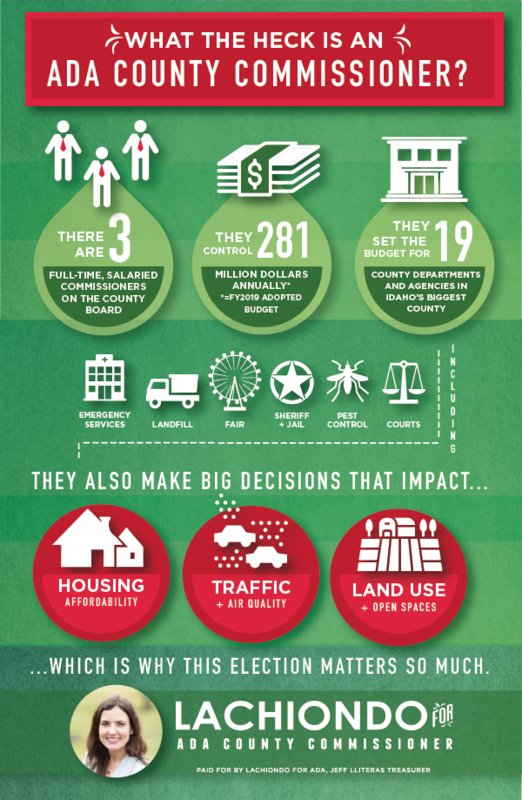 Click to learn more about the Ada County Commission. I Will Fight For Responsible Growth. Ada County is growing, and growing fast. We urgently need a comprehensive area plan to keep our communities affordable, connected, and livable. Unchecked sprawl, traffic congestion, and poor air quality do not have to be our future: with new leadership, we can chart a better course. Regardless of their political affiliation, Ada County residents are worried about growth, preserving our open spaces and protecting our quality of life. Today’s decisions will have lasting impact on every generation that follows, and we need leaders who take that charge seriously. Ada County is currently one of the fastest growing geographic areas in the country, and in order to keep our community livable, connected, and thriving, our commissioners should be leading on a valley-wide comprehensive plan for good growth. Ten years ago, a regional plan was attempted for our valley and, sadly, fell apart. I’m ready to take up that cause, and bringing stakeholders to the table for the development of a comprehensive, county-wide plan for sustainable, smart growth will be my first priority as commissioner. What does Medicaid Expansion mean for Ada County? Passing the ballot initiative for Medicaid Expansion will save Ada County taxpayers over $4,000,000 a year, create new local jobs, and help our working neighbors get access to basic care. Simply put: it’s the right thing AND the fiscally responsible thing to do. I’ll be voting yes and urge you to join me. Not all campaign contributions are created equal. I Reject Cronyism and Waste. Your tax dollars should never be wasted on inefficient systems and outdated solutions. As commissioner, I pledge to think creatively, use resources wisely, and make choices that save the taxpayers money in the long term. As the saying goes: better to fix the roof while the sun is shining. Modest investments in forward-thinking, proactive solutions are essential to avoid more expensive, more complicated, and more difficult to solve problems down the road. Ada County government has the opportunity to lead, and I intend to ensure that happens. Your tax dollars should never be wasted on pay-to-play cronyism, avoidable lawsuits, and partisan nonsense. I will foster ethical, transparent, and diligent government with everyday people as my top priority. I Support Real Solutions for Our Addiction Crisis. Thousands of Treasure Valley families are being impacted by the opioid crisis, an issue that must be treated with urgency instead of lip service. Year over year, the number of opioid deaths has quadrupled in our community- a trend we can't afford to ignore. The financial impact of addiction falls squarely on county taxpayers in emergency rooms, hospitals and, too often, our overcrowded county jail. Despite this, Ada County leadership regularly threatens to revoke funding for critical services like Allumbaugh House, the detox and mental health crisis center that affordably serves hundreds of county residents who would otherwise end up in the ER or jail. As demonstrated by my work on Allumbaugh House, affordable housing for veterans, and homelessness, I know how to bring regional leaders to the table to tackle our toughest challenges, and I pledge to leverage these relationships and resources to immediately address this particular public health emergency.